Your 3D printed medical and dental model will be an amazingly accurate 3D replica made directly from the scans we are provided with. Utilizing our leading edge technology and software and the same technology that is used in the most advanced medical and dental reconstruction cases. In addition to the SLS models being extremely accurate, they can also clearly communicate the injury or issue even to those without medical training, which provides a powerful advantage. Imagining having the ability to ‘virtually’ reach into the body and pull out a duplicate model of a bone injury or dental issue, that could be rested on the table or passed around. That’s not far off from what we do! 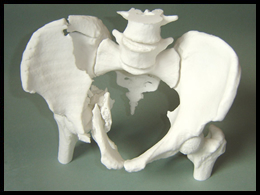 The SLS models created by 3D Prototype Design are as accurate as the quality and resolution of the original CT or MRI scan data that is provided. Once the data is prepared, the model is sliced into layers within the computer software and then is physically built, one layer at a time at .004″increments (about 2 hairs thick) until all layers are complete. 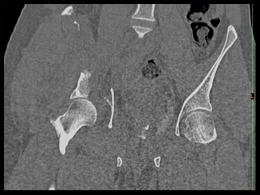 In addition to creating a duplicate of the injury or issue, there is also the ability to reproduce post-surgery models with hardware such as pins, screws and rods in place. Our SLS models not only assist medical experts prior and throughout a patient’s recovery, they also offer the legal community with compelling demonstrative evidence. Much like creating a prototype of a new invention or design, dentists are now able to customize dental appliances; crowns, veneers inlays and even teeth for their patients using the high tech tools and some of them have the equipment right in their office. With specialized, in-house scanning technology and 3D printers designed to use medical grade, non-toxic safe materials, dentists are finally cool. To learn more about 3D printed medical and dental models, please contact us today for more information.